What Ingredients are in Indian Butter Chicken? How Do I make Chicken Makhani? In a large bowl or zip-top storage bag, mix together the yogurt, lemon juice, turmeric, garam masala and cumin. Add the chicken and toss to coat. Cover (or close), and refrigerate for at least 1 hour or up to 24 hours to marinate. In a large pan over medium heat, melt the butter together with the oil. Add the onions, and cook, stirring frequently, until translucent. Add the garlic, ginger, and cumin, and cook until the onions start to brown. Add the cinnamon stick, bay leaves, star anise, tomatoes, chile peppers, and salt. Stir to combine. Add the chicken and marinade to the pan, and cook for 5 minutes. Add the chicken stock. Bring the mixture to a boil, then lower the heat and simmer, uncovered, for approximately 20 minutes. Stir in the cream and tomato paste. Then add the almonds (or peanuts or cashews), and cook for an additional 5 minutes. Remove from the heat. Garnish with fresh cilantro leaves. Remove the bay leaves, star anise, and cinnamon stick before serving. Marinate chicken for at least 1 hour or up to 24 hours. This creates a very tender chicken. I usually mix mine together the night before and place it in the refrigerator to marinate. The next afternoon, it’s ready to go when I’m ready to make dinner. 2). You may use 1/2 stick of butter if you prefer. This makes a very flavorful sauce. 3). I use a lot of ginger in weekly recipes. I buy it pre-grated in the tubes in the produce section of the grocery. I also buy it jarred from my Indian grocer. For fresh ginger, I buy a small knob. For this recipe, buy approximately a 3-inch piece of fresh ginger. 4). Traditional Indian dishes use fresh whole tomatoes but canned diced tomatoes may be easily substituted. 5). Anaheim chiles may be substituted. These are not readily available in my area so I substituted jalapeno peppers. 6). Cauliflower pairs well with this recipe and is the perfect vehicle for soaking up that delicious sauce. You may opt to cook them in with your sauce instead of steaming. This is my favorite way to cook the cauliflower when I make Indian food. How long Does Butter Chicken Last? 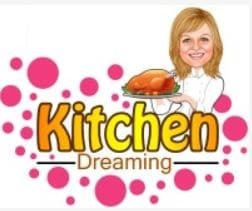 REMEMBER TO SUBSCRIBE TO KITCHEN DREAMING NEWSLETTER FOR FREE AND RECEIVE NEW RECIPE NOTIFICATIONS DELIVERED RIGHT TO YOUR INBOX! Tender, juicy chicken in a thick, aromatic sauce. Serve with Basmati rice to soak up every bit of that delicious sauce. Simply delightful Indian Butter Chicken – ready in just 30-minutes; it’s what’s for dinner. 1). Marinate chicken for at least 1 hour or up to 24 hours. This creates a very tender chicken. I usually mix mine together the night before and place it in the refrigerator to marinate. The next afternoon, it’s ready to go when I’m ready to make dinner.2). You may use 1/2 stick of butter if you prefer. This makes a very flavorful sauce.3). I use a lot of ginger in weekly recipes. I buy it pre-grated in the tubes in the produce section of the grocery. I also buy it jarred from my Indian grocer. For fresh ginger, I buy a small knob. For this recipe, buy approximately a 3-inch piece of fresh ginger.4). Traditional Indian dishes use fresh whole tomatoes but canned diced tomatoes may be easily substituted.5). Anaheim chiles may be substituted. These are not readily available in my area so I substituted jalapeno peppers. 6). Cauliflower pairs well with this recipe and is the perfect vehicle for soaking up that delicious sauce. You may opt to cook them in with your sauce instead of steaming. This is my favorite way to cook the cauliflower when I make Indian food. Finally tried it and am happy to say it was a crowd pleaser. My friend gave me your site, specifically for this recipe and it was every bit as delicious as you described. Thank you, Scottie, for your kind words. I really appreciate that. I’ve been wanting to try Indian food but have been afraid of it being too spicy. If your daughter can eat it, I’m convinced I can try it too. Hi Michelle, She will be thrilled to learn that she inspired someone to try a new food. She’s a very adventurous eater. She makes me so proud. I hope you enjoy it and please do come back and let me know how you liked it.